Once commonly called single-wide and double-wide mobile homes, Redman Homes manufactured homes are factory-built houses engineered and constructed to the strict specifications of the U.S. Department of Housing and Urban Development’s (HUD) federal building codes. Manufactured homes built by Redman Homes come in many styles and with so many features and options available, homebuyers can customize their new home to meet their lifestyle. Modern kitchens with stainless steel appliances and perhaps spacious bedrooms with walk-in closets? We offer them. Luxurious, spa-like master baths? Those, too. 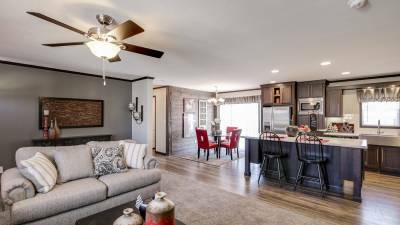 You can also find stylish features such as tray ceilings, recessed lighting, custom cabinet applications, large family rooms with entertainment centers and more.